What beautiful colors ... you find such beauty even in the broken things of life. Glad to hear you and your family is okay. Poor broken pot, it's still pretty though! Oh. Oh my! This one is a masterpiece. Yes, a real masterpiece. Sorry about the broken pot. It still looks beautiful even if it is no longer useful. Keep safe. hope you are safe and well out there. sending positive vibes your way...and lots of love. broken but you make it to be stunning! your work never failed my expectations.. love it!!!! hope all is going okay....thinking of you! Be well. And let us know you are okay. i hope you all are ok. you made this broken piece look like a work of art. I love how you saw that the beauty was not lost even though it was broken. True seeing! Fragments bring good luck. So you might hold on to that pot. Give it a nice display like here. I hope all is well and you are safe. Thinking of you. The blue shawl of dawn. A frigid lake on a clear day. My father's eyes, passed on through some genetic chain to my oldest son and to his son. Oh yeah, the blues. Weather is a reminder that we are not the ones in charge. 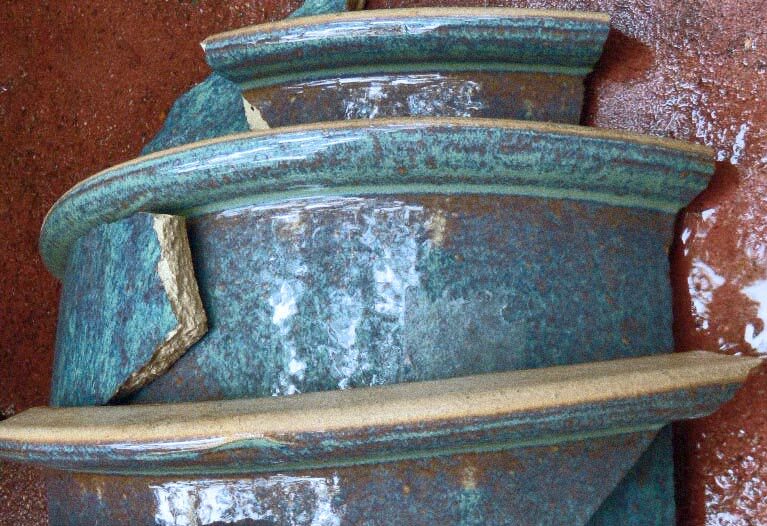 This broken pot makes for a lovely sculpture and would be really cool as a light shade for a wall sconce, with the light directed out the top and through the cracks.